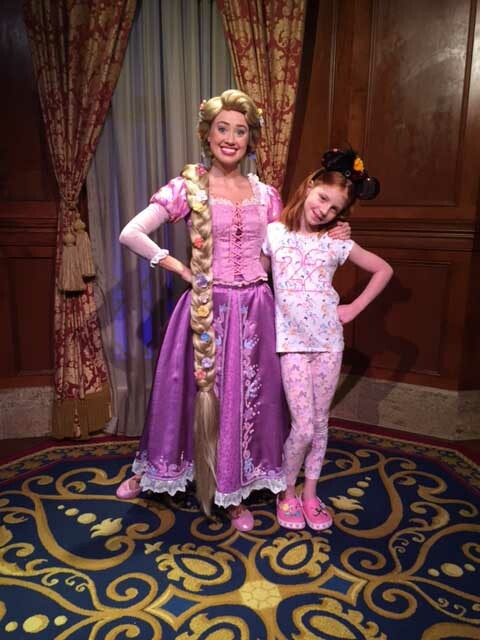 On holiday to Walt Disney World, my daughter Morag was delighted to make the acquaintance of Disney Princess characters including Rapunzel, Cinderella, the popular Anna and Elsa and the delightful Belle. All princess characters wore sumptuous dresses that would not be out of place in a fairy tale ball scene. Morag meeting Rapunzel at Walt Disney World,. With the release of the new Beauty and the Beast movie, I was minded of the wonderful choice of evening gowns in our fashion collection at National Museums Scotland and wondered what I would choose to wear to the ball. The gowns I have selected come in a vast array of designs, colours and fabrics and span a period of some 250 years, back to the first publication date of Beauty and the Beast. This traditional fairy tale was written by by French novelist Gabrielle-Suzanne Barbot de Villeneuve and first published in 1740. We have gowns from 1740 right up to the present day, reflecting the sophisticated fashions of the time. As Belle wears a yellow ball gown to dance with the Beast in his castle, I would have to consider this astonishing yellow mantua ball gown. Just imagine trying to get into it, let alone being able to navigate across the dance floor and through doorways. I think this may be a bit too high risk for me to wear to a ball. I may need an army of assistants to actually get into it and with my two left feet, dancing might be a bit problematic. 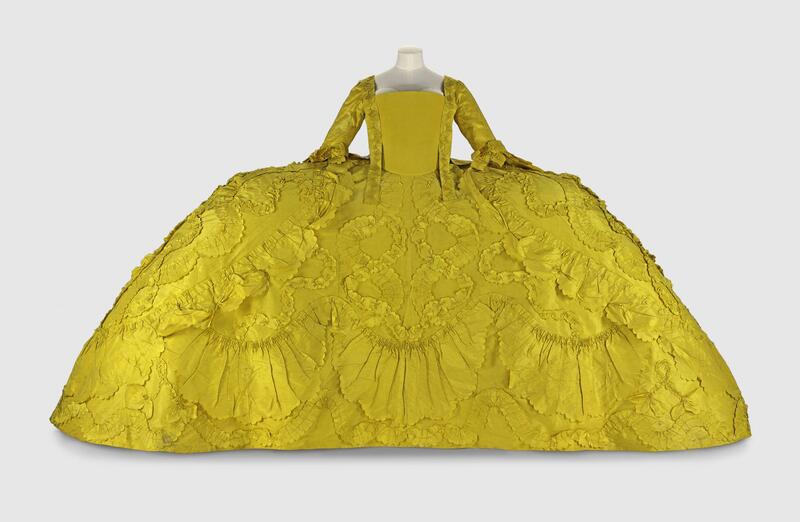 Mantua of bright yellow silk worn at a ball at Holyrood in 1760 by Helen Robertson of Ladykirk: British, c. 1760. The Beauty and the Beast movie features the enchanted red rose, which is similar to the the fabric of this red silk woven volante style gown. It has a repeat foliage design in white, silver and green and belonged to the Earls of Haddington. This stylish dress was made at the time the original fairy tale was published and its is something I might attempt to dance in, although it might be better placed on the set of Poldark. 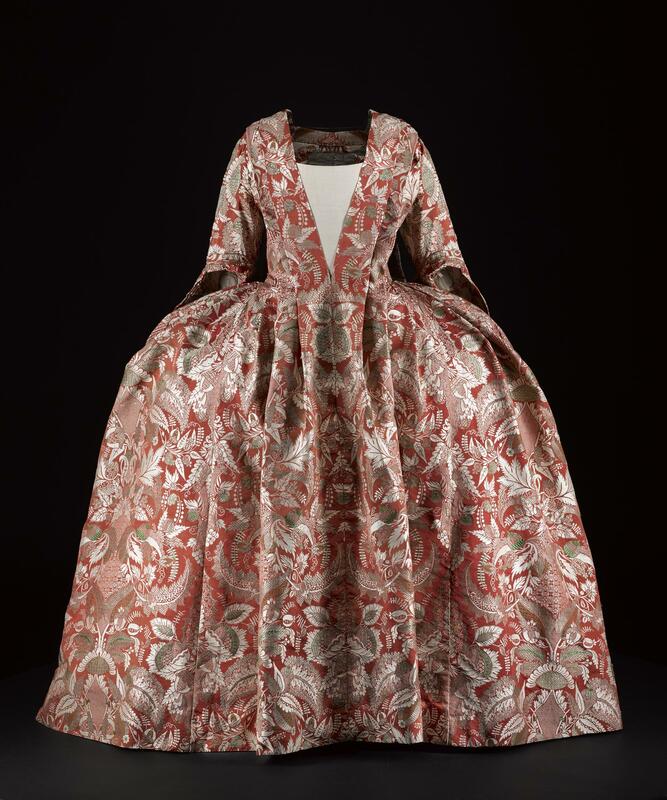 Woman’s dress in red silk woven with a dense mirror repeat design of foliage in white, silver and green, in a sack (sacque) back or robe volante style, belonged to the Earls of Haddington, textile c. 1726-1728, dress c. 1740. 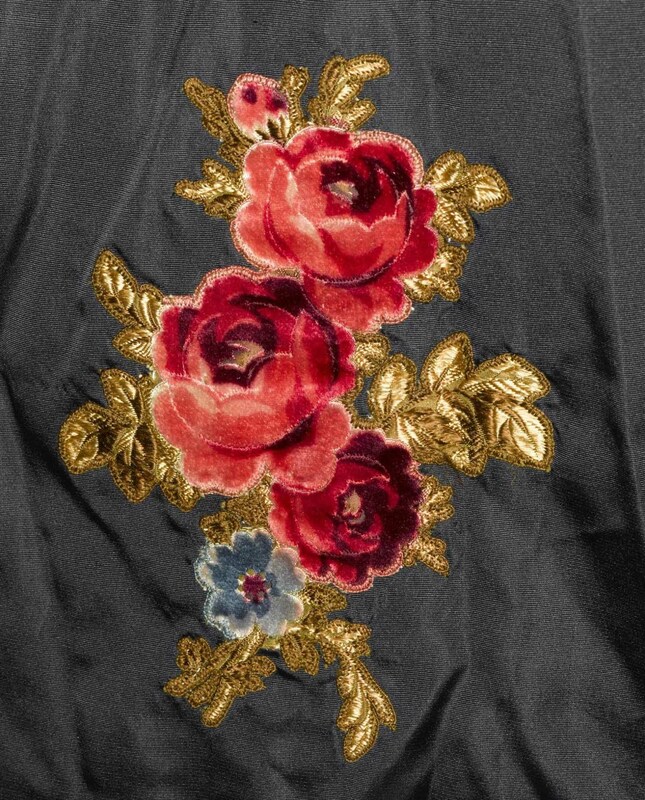 I also came across this more up-to-date decoration of roses, with applied flowers in printed velvet, on a 1920s evening dress by Jeanne-Marie Lanvin The roses in this design are very vibrant and certainly not of the wilting kind as in the Beauty and the Beast story. 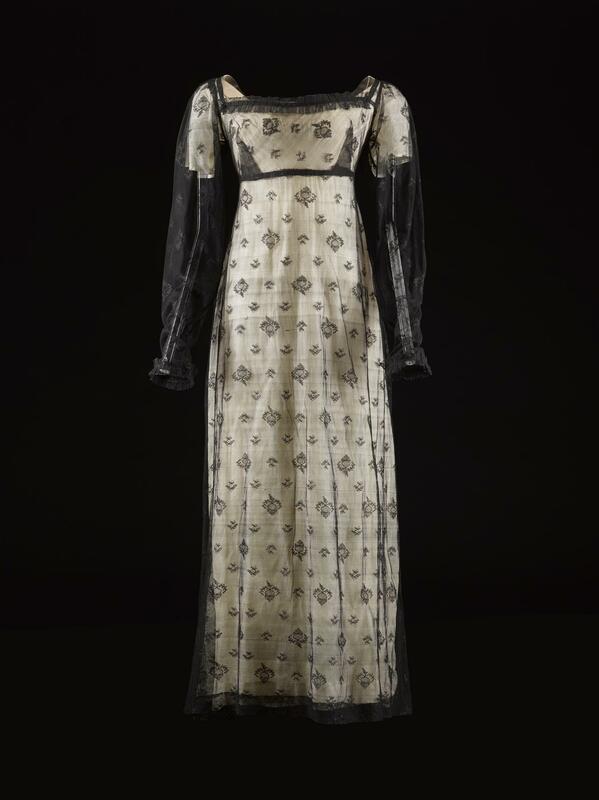 Another contender for an elegant ball gown, and one of my favourites, is an early 19th century dress of black net, embroidered with a floral design in a style in vogue just after the French Revolution. This style ticks all the boxes for wearing at a ball as there are no bits of skirt protruding that could get caught in doorways and it would be easier to sit on a chair when you needed a rest from all the dancing. Moving forward a couple of decades, there is an exquisite white silk evening dress that is evocative of the type of gown worn by Queen Victoria in the early part of her reign. Just imagine waltzing across the floor with your beau at the ball, with the light rustling of silk as you dance the night away. It’s a very romantic garment and something I could see myself wearing. 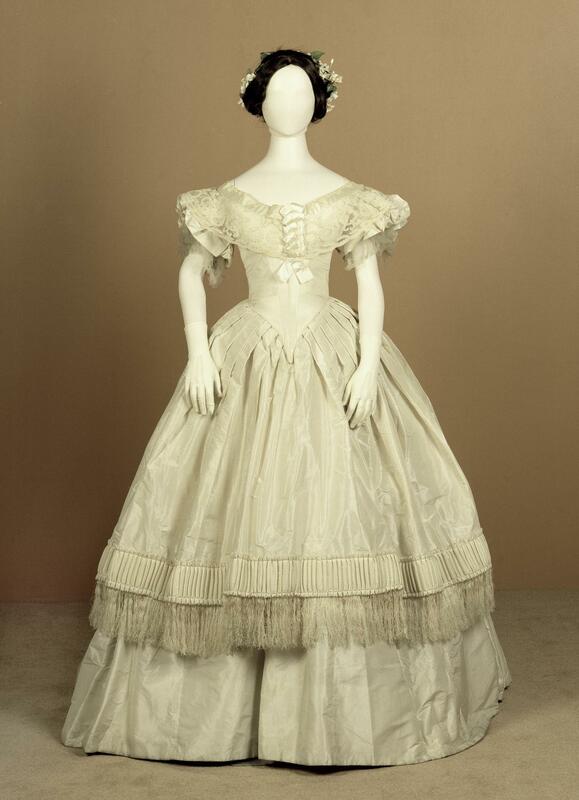 Dress of white silk taffeta trimmed with white silk fringing, part of a woman’s evening dress: British, c. 1852 – 1857. 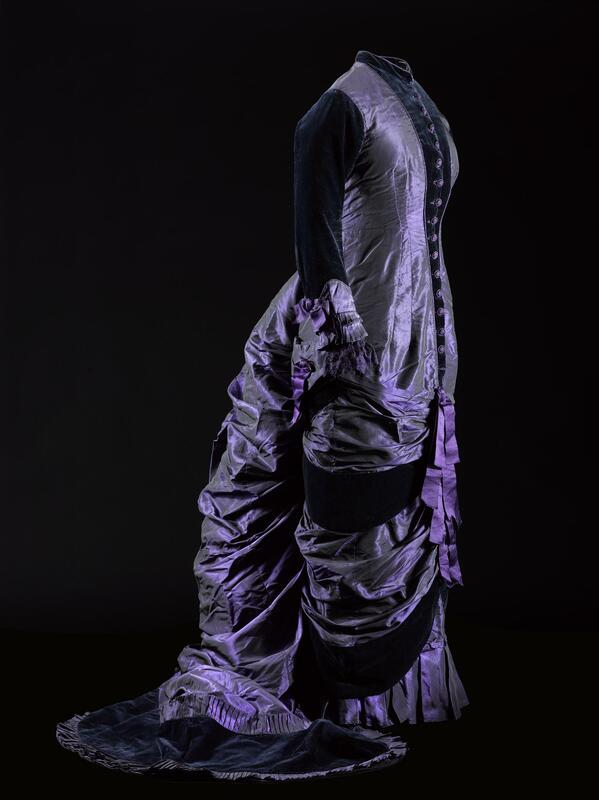 Not strictly speaking an evening dress, and it would have been a bit hot to wear to a ball, but the vibrant colour of this late 19th century purple gown would certainly have been a showstopper! It is constructed in the princess line, in purple and black shot silk, trimmed with silk velvet, with a high round neckline, full-length velvet sleeves with shot silk cuffs trimmed with lace and a narrow skirt with a train falling in swags and cascade. It’s not something I would choose to wear as, although its stunning, I think it would be a bit restrictive when worn. Woman’s dress, in purple and black shot silk, trimmed with silk velvet, constructed with the princess line, with a high round neckline and centre front fastening trimmed with velvet, full-length velvet sleeves with shot silk cuffs trimmed with lace, narrow skirt with train falling in swags and cascade, with purple silk ribbons trimming the centre front, panels of velvet and velvet finishing the train: British, c. 1874 – 1879. A dress that would be more my style and one to make others green with envy is this gorgeous post First World War dress from Maison Lucile. It captures the spirit of the age and the soul of its wearer, while the fresh spring colour signifies hope. Another splendid choice is this Lanvin dress from the 1920s. It is certainly wearable and is a definite contender to wear at the ball. 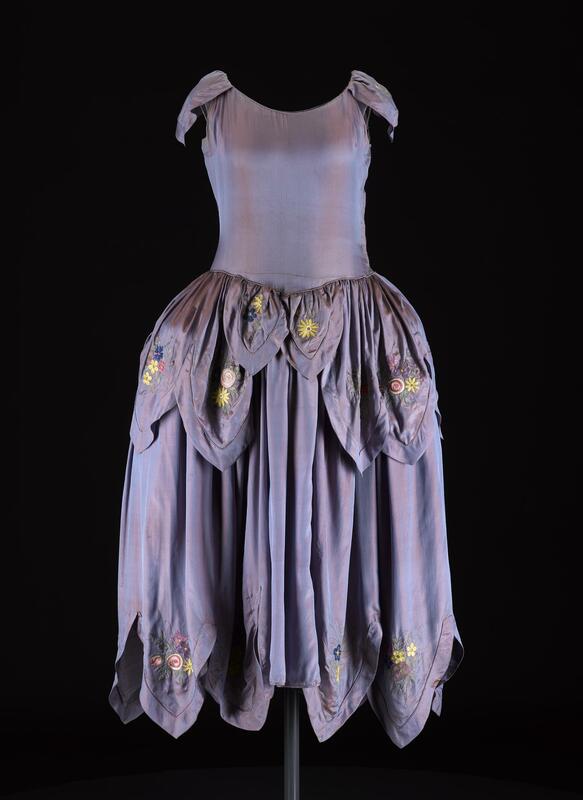 Women’s robe de style dress, in ‘bleu de lanvin’ irridescent (or shot) blue silk, with multicoloured floral embroidery at the hem and hips, featuring cap sleeves, a dropped waist with full pannier hips and a ‘petal-shaped’ hemline: France, Paris, designed by Lanvin, c. 1924. I could always opt for a multi-coloured gown such as this one from by Hardy Amies. Its reminds me of the full skirts of the 18th and 19th centuries, with a 20th century bodice twist. Despite being modern, I might need some help to tie the large turquoise sash at the rear and I’m not sure it would be very comfortable to sit down in – more of a standing up dress I think. 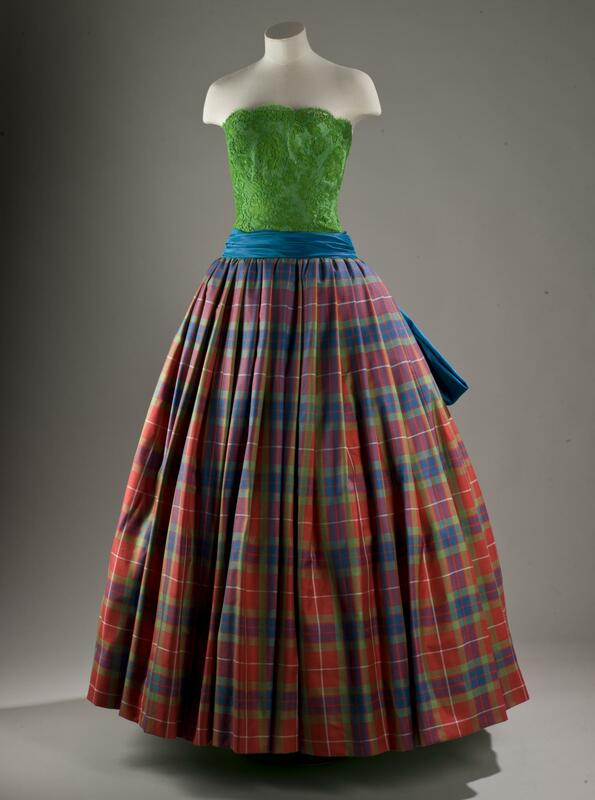 Woman’s ball dress with a leaf green lace bodice, turquoise blue sash and bow, and tartan silk skirt: English, London, by Hardy Amies, 1989. 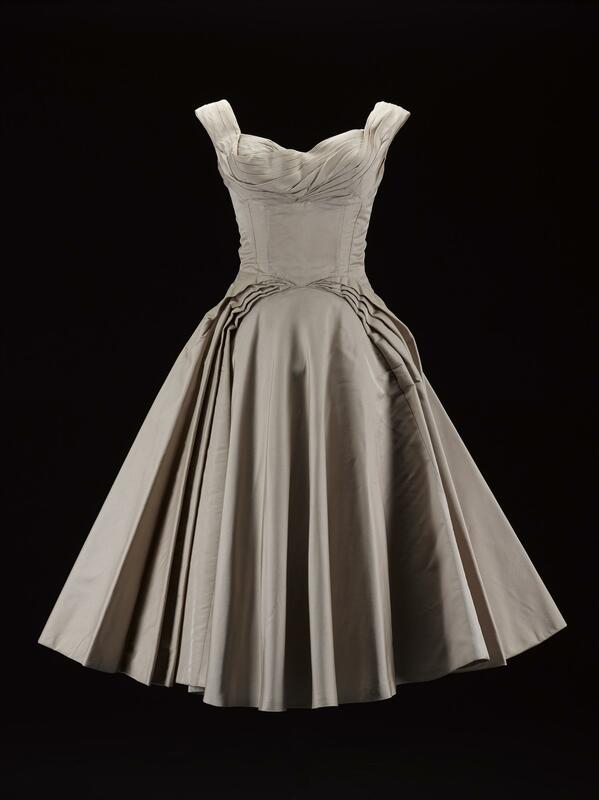 Last but not least, if I were to create a subtle presence at the ball, I could choose to wear this silk taffeta 1950s ball gown by Ceil Chapman. Like the 1920s dresses, it contrasts with the gloom and austerity of the Second World War, with an air of sophistication and Hollywood inspiration. It’s also a fairly neutral colour that wouldn’t be garish or attract too much attention to the wearer. Woman’s evening dress or ball gown, in pale beige silk taffeta, with a low sweetheart neckline with pleated detailing and wide shoulder straps, fitted, structured bodice with off-centre seams and padded bust and wide curving pleats to full stiffened skirt, three-quarter length, labelled in the centre back, the bodice of the dress is unlined, the skirt lined with stiffened paper: American, by Ceil Chapman, mid 1950s © Estate of Ceil Chapman. I hope you have enjoyed my journey through the last few centuries of evening wear from the fashion collection at National Museums Scotland. For further inspiration of what to wear to the ball, search our collections for women’s dresses and I’m sure that you will find something you like. 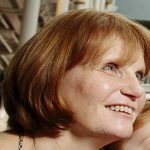 Also make sure you visit the new Art, Design and Fashion galleries at National Museum of Scotland and explore MODE, with 30 objects from the world of fashion, each with their own fascinating story to tell. In the meantime, here’s a taster of what Belle wears in the new Beauty and the Beast movie.